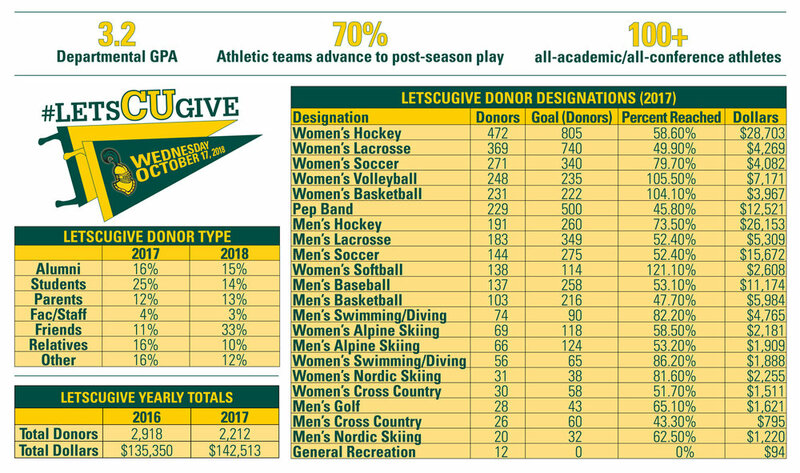 As a longtime member of the athletics department, I have not seen another fundraiser that has had more of a direct impact on each program than the LetsCUgive campaign has had. It has allowed our student athletes to become engaged in the fundraising process through which they can see the immediate benefits of their work. Over the past two years, the student-athletes and coaches have raised more than $280,000. Each program has used the funds in various ways, and in each case, the money has been used to enhance the student-athlete experience. Just as important as the money raised has been the engagement of our alumni. This campaign provides a way for alumni to donate to something that they know will be beneficial. It has reconnected many to the University and to the programs themselves. Finally, the campaign shows the importance of giving back to our current student-athletes. It doesn’t matter if it is $5 or $5,000 — they see that every dollar counts. As you will see in this report, the LetsCUgive campaign has been invaluable to our department. We thank each and every one of you who has supported the campaign and look forward to your continued support. The LetsCUgive campaign has allowed us to meet our team needs whether those needs are extra bats, conditioning equipment or new training aids. LetsCUgive has impacted our program greatly. It has reduced the financial burden of the spring training trip for the team. We have been able to improve our video editing and scouting capabilities for player development and opponent preparation. It has given us the ability to provide a first-class experience to all players. We have used the donations to help fund our winter training trip to Florida and to help pay for our championship suits for the Liberty League. These are important parts of our season and necessary for our success. LetsCUgive has given our team the opportunity to acquire upgrades for our team. We were able to purchase a shooting machine, a clock that counts down the game clock in our locker room and gear for the team. It has also allowed us to update the locker room and put money aside for a team trip abroad. The campaign helped us purchase equipment that our program needs to stay competitive. We were able to purchase our shooting gun. This equipment is used by our student-athletes daily and has allowed us to compete with programs in our conference. Our team led the conference in 3-point shooting and set school records in 3-point shooting this past season. The campaign has helped the program take steps to become a competitive team in the Liberty League. From helping to recruit the next Golden Knight, to funding our European tour, the campaign has provided the resources for our team to progress and for our program to become closer as a unit. The campaign has been instrumental in helping players offset equipment and practice gear costs. We have used these funds for office and locker room upgrades as well. The campaign has allowed our program to stay in to touch with our alumni, and through their generous support, we have been able to continue to improve the program and facility. LetsCUgive has helped enrich the experience of the student-athletes on the team. It has allowed us to provide gear and equipment that helps push their game to the next level while relieving additional financial burdens. The LetsCUgive campaign and the generous donations from our alumni, fans and supporters have helped us tremendously. The women’s soccer team traveled to Portugal (and has begun saving for a team trip abroad in 2020). LetsCUgive has helped provide our players with a better student-athlete experience. It has allowed us to buy warm jackets to wear on the sidelines, obtain comfortable transport and accommodations for away games, extend our reach while recruiting new talent and much more! The campaign has provided our student-athletes with experiences and opportunities that have helped create a winning environment and tradition. 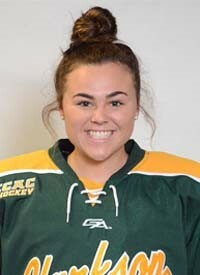 One of those opportunities is being part of the first international NCAA women’s hockey games in Belfast, Ireland. Without the generous support of so many, this experience would not have been possible. We are extremely grateful to everyone who has made the LetsCUgive campaign possible. LetsCUgive is one of the most important days of the year for our program. We always strive to improve our student-athletes and program, and the funds we raise on giving day are critical to us. We invest back into our development model — from nutrition, to new training and recovery technology for our team and staff to use to make us better. The LetsCUgive campaign has allowed us to meet our team needs. We were able to purchase a tent to keep us out of the sun during long, hot races, and we were able to help defer costs for our warm-ups. Because you gave we have been able to purchase new training equipment. This training equipment has helped our teams compete for national championships. Because of you, we have been able to cover the costs of our camps which provide us with the training volume we need. These training camps keep us competitive and have helped our men win the national championship in giant slalom last season. Because you gave we have been able to make upgrades with a golf simulator in Walker Arena for use during the winters. This has proven invaluable as we will be able to be competitive in our league championships in the spring. The pep band was able to travel to Belfast, Ireland to support the men’s hockey team because of your support. Some members were fortunate to travel with the women’s hockey team and helped cheer them on to their third national championship. 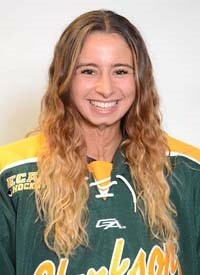 Clarkson athletes actively help the local community. Clarkson athletes are winners on — and off — the field, as they help the local community in Potsdam. 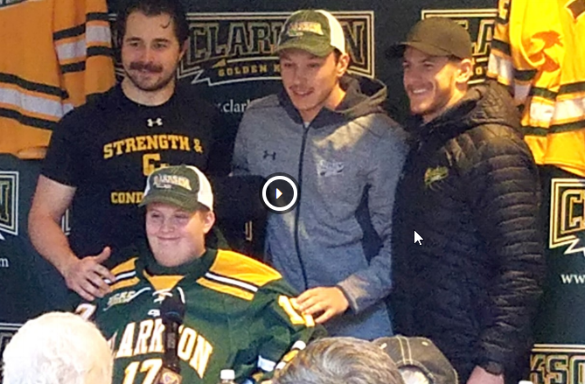 The Clarkson University men's hockey program held a special Draft Day celebration at Cheel Arena as the Golden Knights welcomed Christian Harvey as their newest team member. Through the help of the Team IMPACT program, Christian became an official Golden Knight while courageously living with a spinal cord injury. A 13-year-old native of Massena, New York, Christian was in a diving accident in the summer of 2016 that shattered his C5 and C6 vertebrae, leaving him paralyzed from the chest down. Clarkson University’s Student Athlete Advisory Committee (SAAC) held a kids-athlete afternoon in the IRC field house last December. Children age five and up spent time with Golden Knights student-athletes and played their favorite sports from baseball, softball and basketball, to golf, lacrosse, cross country and skiing. Donations were raised for the Potsdam Holiday Fund. 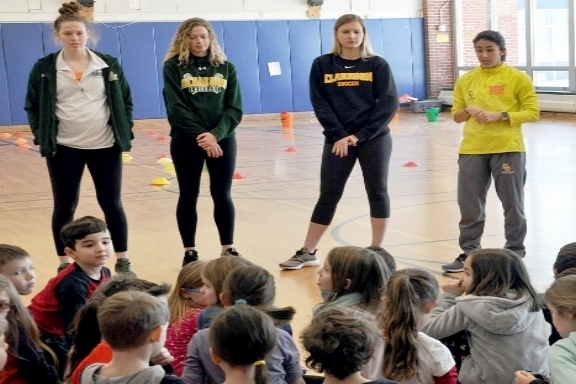 Clarkson student-athletes went to Lawrence Avenue Elementary School during the school’s gym classes to guide students from kindergarten through third grade as they played sports, with a focus on sports in the Winter Olympics. The event was one of more than 1,000 events that took place to honor the 32nd annual National Girls & Women in Sports Day, which was celebrated officially on February 7. The Golden Knights women’s teams provided fun facts on the history of Title IX and famous women in sports history. Artist’s renderings of some of the renovations of the new Cheel Campus Center & Arena. Let’s Go, Tech! Nearly 30 years after it opened as “Clarkson’s front door” to the North Country, the Cheel Campus Center & Arena is undergoing a major overhaul that will modernize the building’s infrastructure and expand its footprint to add more state-of-the-art features that will enhance programmatic offerings, hockey facilities and student life at Clarkson while providing further economic benefits to the surrounding community. The Cheel Campus Center & Arena will not only be an updated space for students and community members, but provides an opportunity for Clarkson supporters to show their pride and dedication by placing their names in the new center. Some suggested naming opportunities are arena sections/seats, lockers, major spaces and much more! Please check back with Clarkson’s websites and social media channels on how you can be a part of the new Cheel.